From "The Company Men": Phil joins the queue, waiting for an interview. Copyright: 2010 Folger/Weinstein Co.
There’s a theory that family-run businesses have inherent limitations: If a modern company is to attain any measure of “scale and scope,” the theory says, control by owners has to give way to decision-making by a cadre of trained and experienced professional managers. “Personal” management by original entrepreneurs and their too-often-incompetent relations often results in stagnation: there’s a reluctance to take risks or expand into new areas. Meanwhile, the idea persists that such profit-maximizing corporate bureaucracies are less humane than family firms. Yes, in family-run outfits, key decisions may border on eccentricity, the vision may be limited, and technical expertise may be in short supply, but such organizations seem to be more caring towards a “family” of employees and other stakeholders. The current movie The Company Men makes its own statement about these ideas. Bobby (Ben Affleck), Phil (Chris Cooper), and Gene (Tommy Lee Jones) all work at corporate giant, GTX—and one after another, each gets laid off. Under threat from a corporate raider, GTX has to take serious measures to get its stock price up, and that means wave after wave of firings. Younger workers may be the first to get the ax, but soon, human resources targets those over 50 since they have higher salaries. 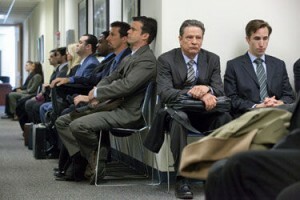 They also have the hardest time finding a new position: Middle-manager Phil, gray-haired and pushing 60, is Company Men’s representative of this generation, and to its credit the movie pulls no punches about the age discrimination now rampant in the U.S. The youthful Bobby is most optimistic about his job prospects, but soon is forced to take a low-paid construction job with his brother-in-law, Jack (Kevin Costner). Residential construction is hardly a means to great wealth, and it becomes clear that Jack is putting in a lot of unpaid labor on a house-renovation project in order to meet his budget. He’s even losing money on the job. But he manages to put an extra $200 into Bobby’s paycheck. They don’t like each other much, but they are, after all, family. So these are the two primary models of capitalist organization in the movie: The uncaring, almost dysfunctional corporation that seems to have lost its bearings if not its very reason for existing; and the marginal family firm that still has a heart but few earnings. Near the movie’s end there appears yet another model of organization: the idealistic, even visionary entrepreneurial startup. Gene, who was in top management at GTX before getting his pink slip, has stock options worth millions. His belief in the possibility of making something you can see, not just numbers on a spreadsheet, prompts him to take a flyer on reviving a now-decrepit shipyard. Several of the laid-off GTX workers—Bobby included—throw their lot in with Gene. Perhaps the movie is right in suggesting that this kind of enterprise is the one that embodies the ideals of recession-hammered Americans today. But it is significant that the movie ends before it becomes clear whether this startup will survive or fail. Just as many unemployed folks have gone home to live with their parents, so it is that the tiny family firms often prove to be the last economic refuge. [i] Adolf Berle and Gardiner C. Means, The Modern Corporation and Private Property (New York: Macmillan & Co., 1932); Alfred D. Chandler Jr., Scale and Scope: The Dynamics of Industrial Capitalism (Cambridge: Belknap Press, 1990); John Kenneth Galbraith, The New Industrial State (Princeton, N.J.: Princeton University Press edition, 2007). Next post: Can ‘Airworld’ Truly Be the City of the Future?